The Princes Street Mile races were held, as you might expect, on Princes Street in Edinburgh in the early 1990’s. They were glittering affairs with races for Men, Women, Masters, Juniors, Youths and Intermediates. All were invitation only and the race organiser had a good budget to work with. The results were class races, good coverage and live television coverage. They were probably too good to be true. The programme cover above was for the first ever such race which was held with great razzmatazz, celebrity milers of the past from all over the world with Scotlnd being represented by Frank Clement, Ian McCafferty and Hugh Barrow in the parade. The starting lists make interesting reading. The headline races were for the Senior Men and Women. The Men’s line-up was printed in the programme as follows, although there were some changes on the day, all the stars did turn out. Fermin Cacho (23) Spain, Olympic Champion; Steve Cram (31), England, ’83 World 1500m title, ’84 Olympic silver, World records for 1500m, Mile and 2000m in 1985; Tom McKean, Scotland, 800m specialist. ; Mohammed Suleiman, (23), Qatar. Olympic bronze behind Cacho; Jens-Peter Herold (27), Germany. European 1500m winner; William Tanui (28), Kenya. 800m gold in Barcelona. David Kibet (28) Kenya. Winner of the Dream Mile in Oslo. Joseph Cheshire (34) Kenya. Olympic 1500m fourth in 1984 and 1992. Jim Spivey (32) USA USA Olympic trials winner. Tom Hanlon (25) Scotland. Sixth in steeplechase in Barcelona. Kevin McKay (23) England. Silver in 1988 800m World Junior Championships, semi-finalist in 1992 Olympics. Steve Crabb (28) England. Double Olympian and 3:50 miler. The Women’s field was: Hasib Boulmerka (24), Algeria. Olympic 1500m champion in Barcelona. Ellen van Langen (26,) Holland. Olympic 800m champion. Kirsty Wade (30), Wales. Double 800m/1500m winner in 1986 Commonwealth Games Violet Beclea, (28), Romania. World Indoor 800m silver medallist. Tatyana Dhorovskikh (31) Ukraine. World 300m champion, 1988 Olympic 1500m gold, 1992 Olympic 1500m silver. Lyudmila Rogachova (25), Russia. World bronze, Olympic silver and fastest in the world in 1992. Doina Melinte (35), Romania. World indoor 1500m and Mile record holder, sixth fastest outdoor Mile of all-time, Olympic gold (800m) and silver (1500m) in 1992. Yvonne Murray (27), Scotland. 1988 Olympics 3000m bronze, 1990 European champion. Sonia O’Sullivan, (22), Ireland. World Student Games 1500m champion, fourth in Olympic 3000m Letitia Vriesde, (27), Surinam. Fifth in world championships. So two very good fields indeed and the Masters race had David Moorcroft, Sydney Maree, Graham Crouch, Thomas Wessinghage, Eamonn Coughlan and John Robson, at 35 the youngest in the field! “Scotland’s Runner” previewed the races in their September 1992 issue. “It’s not often we Scots get a chance to see the world’s top middle distance athletes battling it out on our own doorsteps but that’s exactly what will be happening on September 13th. The Princes Street Mile, a new event originally conceived over two years ago by a small group of athletics enthusiasts including Hamish Henderson and top coach John Anderson, has found the funding it needs to go ahead on this date. Split into five separate mile races, which will take competitors from Shandwick Place at Princes Street west end to its east end, the Princes Street Mile will provide its onlookers with an afternoon of top quality athletics against the dramatic backdrop of Edinburgh Castle. Featuring ‘past masters’, women’s men’s and youths’ races, the Princes Street Mile should contain something for everyone. As an invitation only event, the quality of the field in each race is extremely high. John Anderson who has been charged with the responsibility of finding competitors for the event has already secured some major names and is waiting for confirmation from more. “We’ve already got the men’s and women’s Olympic 800m champions in each of the two major races,” reveals Jamie Henderson, project executive for Gameplan which is organising the Princes Street Mile for the Princes Street Mile Ltd, the company set up following the birth of the original idea to hold such an event. Cram’s performance in Edinburgh certainly seemed evident of good road running form. Coming in behind Kenya’s David Kibet and Qatar’s Mohamed Suleiman, who took first and second place respectively, he put in a strong run which appeared all the more remarkable in the light of what he had to say about his training. “In the last few weeks all I’ve done is a little bit of track work,” he confessed, “the first five or six hundred metres hurt a bit as a result but after that I settled down. I didn’t get any more tired. I was catching people which gave me an incentive to keep the pace up.” Late entrant Tom McKean was less fortunate in his form. Suffering from gastroenteritis and still on medication he was forced to pull out after 800 metres. McKean for whom 1992 has hardly been the happiest in his athletics career was planning to take a holiday before starting winter training. It was run on a good and successful course – so they altered it for 1993. More later, but it had been a great success and there was really no doubt that having seen it the spectators wanted more, the council wanted more of the same publicity and having run it, the athletes wanted more. So Gameplan organised another for. 12th September that year. The front runners who had made all the early pace faded badly. Kiptanui hung on well to finish fourth in 3:58 while Kibet crossed the finishing line in 4:01 for eighth, and Cacho ended in ninth suffering from a muscle pulled during the earlier blunder. Obviously the early leaders misjudged, a mistake not made by Yates. who remembered the energy reserve needed after covering the straight course last year. “I found out about the hill last year,” he grinned, with a Citroen car to give his Mum for her birthday and $3000 richer. Yates beat countryman John Mayock into second place in 3:57 while American Jim Spivey crossed the line half a second behind, with Steve Cram, enjoying a return from 5000m to the distance he dominated through the 80’s coming fifth in 3:58. But for Yates the win indicated the world quality that British middle distance running maintains now despite slurs from past greats this year. Steve Ovett enjoyed a race with a group of youngsters in the Race with Stars in the morning, and Yates fired a triumphant blast at his friend when asked why celebrations were so euphoric. The 24-year-old whose season was plagued with injury last year said, “I’m getting fed up with Steve slagging of British middle distance running. World athletics is so much harder now, especially to win middle distance events. But we’ve got me and Curtis Robb who are up there,” he said. It was interesting that Steve Scott, perhaps the world’s greatest, unrecognised 1500m runner of all time, said he believed that Yates would be the man to watch for future Olympic honours at that distance. Scott himself enjoyed his Edinburgh date, winning the Past Masters Mile with a time of 4:14, just ahead of Eamon Coghlan, both of whom are still very much chasing honours and recognition despite respective ages of 36 and 40. Both are the front runners in the bid to be the first veteran to break the four minute mile. Scott said, “I’m just hoping and praying that nobody else does it so I can be the first.” Scotland’s John Robson provided a rare home performance to be proud of with a time of 4:17 in the Past Masters. The Scots performances in the International Men’s race was poor. Phil Mowbray was best placed in tenth with 4:03, Glen Stewart came twelfth in 4:06 and Gary Brown and Tom Hanlon traipsed over the line fourteenth and fifteenth. In the Junior Women’s event a truly striking performance stole the show. Claire Martin from Wales knocked 17 seconds off her previous personal best for the mile, taking Lisa Palmer from England and Kirkcaldy’s Hayley Parkinson by surprise. Parkinson will be joining Edinburgh University in the autumn to study sociology and enjoyed the visit to her alma mater. “I was quite pleased,” she said, “I had hoped to do better as the girl from Wales has a slower personal best for 1500m. I think she surprised us all.” Karen Kirk was placed eighth. In the Junior Men’s race Tom Winter of Edinburgh Athletic Club and Scott Taylor from Babcock Thorn Pitreavie were not expected to make any impression against the mighty Victor Malakwen. Based at the same military camp in Kenya as Moses Kiptanui and with a personal best in the 800m of 1:46.6, he romped the course in 4:14 with Winters running a time of 4:18 and Taylor a second behind in 4:19. The 19-year-old Malakwen said later: “I enjoyed the race but the ground was too hard for me, but then it was my first time in a road mile.” Heinz Frei of Switzerland had no trouble manoeuvring the turn in winning the wheelchair mile in 3:21. The turn varied from last year’s straight mile but the new course provides a better arena dor the 25,000 spectators police estimated had turned out for the day. Promoted by Standard Life and supported by Lothian Enterprise and the city council the event is now one of true world standing and Mike Wilson of organisers Gameplan said an announcement would be made in the next four weeks on its future. Results: Men: 1. M Yates (England) 3:56; 2. J Mayock (England) 3:57; 3. J Spivey (USA) 3:57. Women: 1. S O’Sullivan (Ireland) 4:25; 2. Y Murray (Scotland) 4:26; 3. E van Langen (Netherlands) 4:29. Wheelchair: 1. H Frei (Switzerland) 3:21; 2. D Holding (England) 3:29; 3.F Waque (Netherlands) 3:30. Past Masters: 1. S Scott (USA) 4:14; 2. E Coghlan (Ireland) 4:16; 3. J Robson (Scotland) 4:17. Junior Men: 1. V Malakwen (Kenya) 4:14; 2. T Winters (Scotland) 4:18; 3. S Taylor (Scotland) 4:19. Junior Women: 1. C Martin (Wales) 5:04; 2. L Palmer (England) 5:14; 3. H Parkinson (Scotland) 5:16. Results: Men: 1. M Pegoretti (Italy) 4:07; 2. G Stewart (Scotland) 4:007; 3. A Abelli ((Italy) 4:08; 4. J Mayock (England) 4:08; 5. N Caddy (England) 4:08; 6. C Impens (Belgium) 4:08; 7. R Kibet (Kenya) 4:09; 8. B Treacy (Ireland) 4:10; 9. D Roache (Scotland) 4:10; 10. D Spawforth (England) 4:11; 11. S Fairbrother (England) 4:12; 12. S Healy (Ireland) 4:13; 13. T Whiteman (England) 4:13; 14. A Wanderi (Kenya) 4:14; 15. T Martin (Spain) 4:19; 16. M Hibberd (England) 4:20; 17. V Wilson (England) 4:24. Women: 1. A Griffiths 4:49; 2. O Churbanove (Russia) 4:50; 3. J Kiplimo (Kenya) 4:51; 4. S Griffiths (England) 4:52; 5. K (Hutcheson) Hargrave (Club Sportif Nantfl/Scotland) 4:58; 6. A Buysse (Belgium) 5:00; 7. H Pattinson (England) 5:00; 8. I Sluysman (Netherlands) 5:04; 9. M Zuniga (Spain) 5:07; 10. T Ashcroft (England) 5:10; 11. M McClung (Scotland) 5:17. It is interesting to note how close so many of the men were – six within two seconds of each other and nine within three seconds! The appearance of Karen (Hutchison) Hargraves was also a feature of the race, the former Scottish Commonwealth Games runner was racing in the colours of her French club team after having gone to stay there. 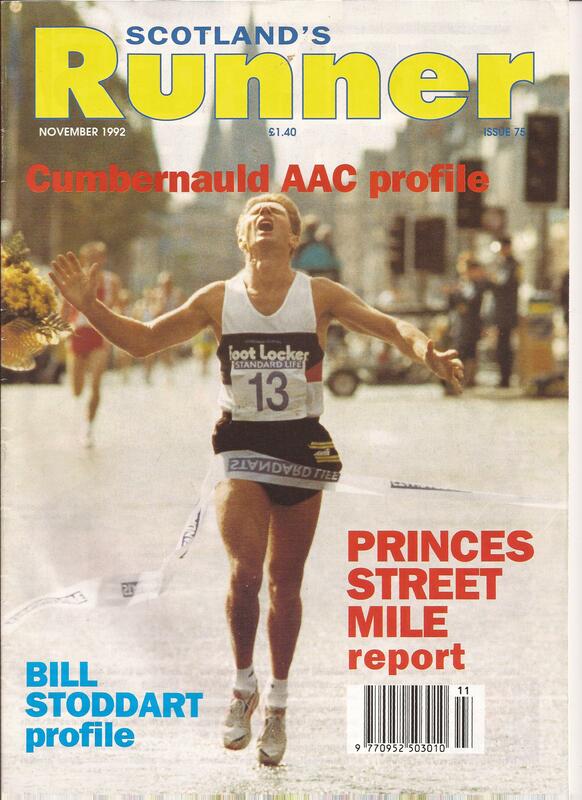 That was the last of the Princes Street Miles – Mike Wilson may well have held the copyright of the title for the race in ’96 was billed as the Edinburgh Mile. Sponsorship wasn’t as good, the course was not as athlete-friendly as in earlier years with several very tight turns (almost U turns in fact) and the races shared the limelight with the mass fields of the BUPA Caledonian 10K. It was a pity that they had to go because everyone enjoyed them but the financial demands on the organisers were probably such that they could not afford to keep it running.